Happy Wednesday, Friends! With the 2018 Nordstrom Anniversary Sale coming to a close this Sunday, August 5th and prices going back up on Monday, August 6th, I decided to browse through the categories once again. Of course I saw several things I love and have yet to purchase. But what's even better is the fact that these pieces are not only ones I have yet to see but are also still in stock in almost all sizes. With the mindset that everything is sold out and the lack of re-stocking items once the sale opened to the public, I have honestly been a little turned away from the sale. So, this got me really excited! I decided it would be fun to put together a post for y'all sharing fifteen (okay, maybe sixteen haha), items that I previously overlooked, am absolutely loving and are still in stock!!! I hope y'all enjoy. I'll share a little more about each piece below. I absolutely adore this suede jacket and was so surprised to see it is still fully stocked. The little puffed sleeve details are adorable! It is for sure the perfect fall jacket to wear over dresses, with a simple white tee and jeans or even pair it wth a suede skirt. I was so surprised to see this cardigan is fully stocked. It is on sale for $52. It has the cutest overlap detail in the back. It comes in blue and black! You can never have too many cute cardigans. I love so many things about this cardigan. The subtle bell sleeve detail is just the cutest thing! I also love how you could casual this one down by wearing it open/unbuttoned with a quite tee underneath and jeans or button it up, tie it and wear it with a skirt for work or church. So many options! This has for sure been a popular item. I mean the ruffle neck detail makes it sooo cute! It comes in four colors and is on sale for under $50. It is in stock in most sizes. Okay y'all, this is the item that had me so surprised when I saw it is fully stocked in all sizes and colors!!! It looks like the perfect cardigan for fall. It comes in FIVE colors: rust, olive green, black, navy and cream. I just ordered it in olive green and the burnt orange color. 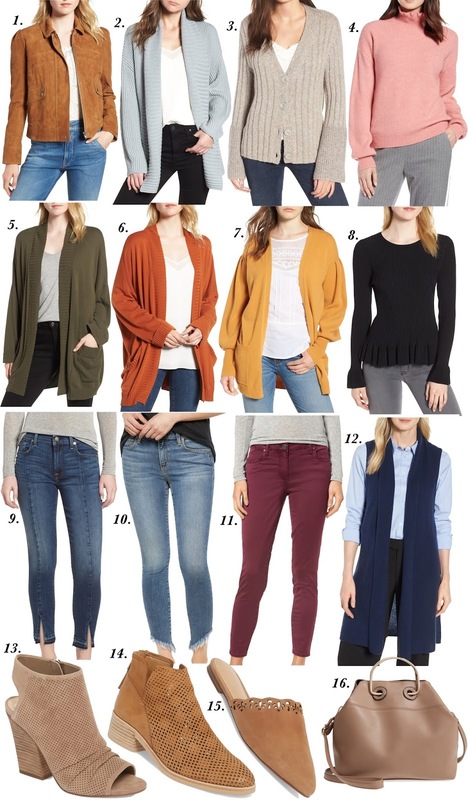 I think it is perfection and will be the perfect cardigan for all fall long. It's on sale for under $60. Grab one up while you can! Here is yet another perfect cardigan for fall. I adore the balloon sleeve details. It comes in six colors and is on sale for $52. It is not fully stocked in every color, but the color I'm loving the most is fully stocked in every size! I absolutely love the yellow spruce color. It will be so gorgeous during fall and makes me think of a fall leaf. This is another sweater that you can do so much with! Wear it with a skirt for church and work, or pair it with jeans and some leopard mules to add a fun touch. I absolutely love the ruffle details, of course. I buy so many of my jeans for fall during this sale. It is especially a great opportunity to stock up on some designer jeans at a discounted price. I absolutely love the slit seam in the front as it adds such a slimming touch to the legs. I just purchased these and cannot wait to try them out! They are not fully stocked, but there are still a handful of sizes available. Here is another designer pair I'm loving! Again, they have the cutest ankle detail. With the asymmetric ankle touch, they again will be so slimming to the legs. I adore the frayed hem detail. These are fully stocked. I am SO happy I came across this pair, because yes, they come in my two favorite colors for fall: olive green and burgundy. These are on sale for only $52. The olive green are limited in sizes, but the burgundy are fully stocked in all sizes! I just ordered the olive green to try. This is such a staple to have in your closet for fall, because you can do SO much with it! The styling options are endless. It's also amazing to get a cashmere piece for under $100. It comes in several colors and will be a great piece to own! I just ordered this one as well. Think the perfect transition bootie. It is enough of a bootie to get you through fall, but it is open enough to transition with through August and September. I adore them! I just ordered them in the tan color. They are under $100 and have the cutest shaped block heel. Here is yet another bootie I'm loving for fall that is fully stocked in this color! I was shocked to see this color is still fully stocked. I had a pair of perforated booties two falls ago that I'm still loving and enjoying, so when I saw these, I got so excited as they remind me of them. They are the same brand as these. Okay, how cute are these?! I adore the cut-out details. They also come in black and are the perfect color for fall. As I mentioned, I had to include a sixteenth item, because how adorable is this bag?! I love the metal handle detail. And it's the cutest shape! I can't believe it's on sale for under $40. So versatile. Well, that's about it! Which piece are you loving the most. If you've gotten any "hidden gems" from the sale like these above, do share! Have a great Wednesday and thanks for stopping by!